Why is it important to maintain a healthy pregnancy diet during the nine months of pregnancy? The nutrition the baby receives during the time she is in utero is vital to her growth and development! During the time she is growing inside the mom, her brain is developing, the immune system is developing, and she is more prone to birth defects during this time, so it is essential that the right foods reach her each and every day. Women who are expecting a child need only about 300 additional calories per day to meet the needs of the growing baby. Drink 6 to 8 glasses of pure water every day. Include protein – it’s vital for both baby and mom during pregnancy. Protein helps tissue development. Folic acid, at least 400 micrograms per day, is also very important to baby’s development during pregnancy. Include fiber-rich foods and foods high in Omega-3 fatty acids. Eat foods from the following food groups each day: fruits, protein, vegetables, grains, and dairy. Excellent sources of protein include meat, chicken, beans, fish, nuts, and tofu. Aim for three servings per day. High fiber foods include options like vegetables, whole grain pasta and rice, whole grain cereals and many types of fruits. Try for 2 to 4 servings of fruit per day, 4 to 6 servings of vegetables per day, and 6 to 10 servings of whole grains per day. Calcium-rich foods include yogurt, milk, cheese, spinach, broccoli, almonds, peas, bok choy, and many others. Servings of these foods should be at least 4 per day. Folic acid is so vitally important for a healthy baby, so eat dark green leafy vegetables, lima beans, veal, chickpeas, pomegranate fruit, and black beans. Foods rich in Vitamin C are also an excellent choice during pregnancy. Oranges, green peppers, mustard greens, tomatoes, grapefruits, tangerines, papaya, pomegranate fruit, and strawberries are excellent choices. Women expecting a baby should try to get at least 70 mg of Vitamin C per day. Research studies seem to indicate that the powerful antioxidants contained in pomegranates are essential for protecting the baby and mom from harmful disease and can actually promote healthy brain tissue development when baby is inside mom’s belly. 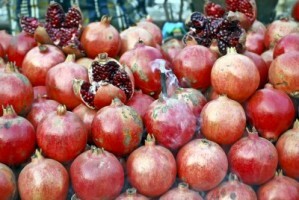 It’s also been noted by scientists that pomegranates have high Vitamin A, Vitamin E, and potassium content – all of which are heartily recommended for pregnant women. 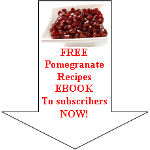 These are excellent reasons to continue eating juicy pomegranates during pregnancy! Pregnant women should strive to eat the healthiest foods available to them throughout all three trimesters. How does she know what to eat? A good rule of thumb is that if it’s a healthy food for mom to eat, it’s probably beneficial for the baby too. Keep this in mind as you shop for just the right foods each week. A healthy pregnancy diet is essential for both mom and baby! Read enough about healthy pregnancy diet and want to discover more about the fruit diets?